Floods and droughts are naturally occurring disasters, that bring with them considerable challenges. These disasters can cause damage to farmer’s crops and affect crop production, damage a water utility’s infrastructure or result in the inability to supply water of an adequate quality and quantity, and the public may not have access to the amenities they once had, such as access to roads or adequate water. Perhaps one of the biggest challenges is the inability to predict if and when such events will occur, and the impact thereof. Importantly, how do you plan for such events and ensure that you are able to respond? The drought in my home city of Cape Town and the surrounding Western Cape province is well documented in the news. As a “Local” from Cape Town I know first-hand the impacts of a severe drought. The drought largely affected my ability to continue my “normal” water usage, because in order to conserve water I had to reduce my water consumption. This meant questioning every drop of fresh water I used and finding ways to reuse water so that I could stay within the daily limit as set by the City. The water restrictions set had the primary aim of reducing water consumption by the public to avoid “day zero”. Day zero is considered to be the point where the taps would run dry and residents would have to queue for water at designated points. In the City of Cape Town, the primary source of water is from surface water resources, with limited use of groundwater. Low rainfalls over the last few years have resulted in low surface water storage volumes. In order to limit the stress on water resources, the city regularly implements water restrictions in years with low winter rainfall. 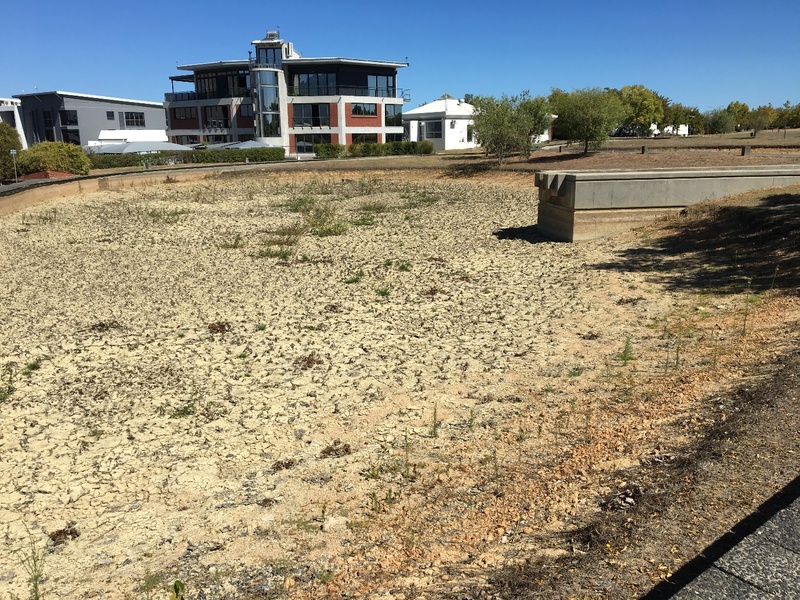 This time around, these water restrictions became stricter as the current drought continued, and surface water resources continued to dwindle (e.g. from Level 1 to currently Level 6B restrictions). At present the current water restrictions limits water consumption to 50L/person/day (or 450 Million L/day for the entire city). In order to augment supply and alleviate the impact of the drought, the city has started to invest in the use of groundwater, as well as desalination plants. This is to change the mix of water supplied to the city, and to reduce the stress on surface water resources during the current drought, and improve water security in the future. In order to assist with flood and drought prediction the Flood and Drought portal (http://www.flooddroughtmonitor.com) was developed as an output of the Flood and Drought Management Tools (FDMT) project. Within the portal, one of the applications, the data and information tool provides users including water utilities with access to datasets in near real-time that allow them to analyse the data and draw conclusions based on their analysis. Our team has been working on developing a methodology that is not too complex or time consuming, but indicates to the utility if they can expect wetter or drier conditions in both the short- and long-term. We are trying to see how best to link this to water safety planning activities, to enable the development of water safety plans that are more resilient to climate change. This is to ensure that water utilities are better prepared and equipped to deal with the new norm of extreme events (i.e. not business as usual). I have found through my use of the tool that one of the biggest advantages of this tool is that it provided me with datasets in one place. This meant I did not have to do an extensive search trying to find data (nor did I have to create various profiles to access different websites!). The tool is also cleverly designed as it allowed me to view data in different formats and outputs, including graphs, tables and maps, or by downloading data and using my own tools to view them. The Flood and Drought Management Tools (FDMT) project funded by the Global Environment Facility (GEF) International Waters (IW) and implemented by UN Environment (UNEP), with DHI and the International Water Association (IWA) as the executing agencies. The project is developing online technical applications to support planning from the transboundary basin to water utility level by including better information on floods and droughts. The project is being implemented from 2014 – 2018, with 3 pilot basins (Volta, Lake Victoria and Chao Phraya) participating in development and testing of the methodology and technical applications. For more information on the Flood and Drought Management Tools project, visit: http://fdmt.iwlearn.org. Join us at the IWA World Water Congress and Exhibition in Tokyo, Japan from 16-21 September 2018 for a training session on “Tools for building resilience” and a workshop on “Climate Resilient Water Safety and Security Planning”. “Climate resilient water safety planning” on 28 November 2018.